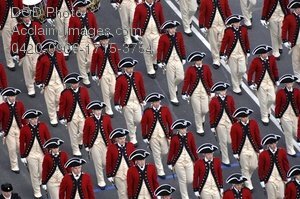 Description: Free, public domain image: U.S. Fife and Drum Corps Marching Down Pennsylvania Ave. The U.S. Fife and Drum Corps marches down Pennsylvania Avenue during the 2009 presidential inaugural parade in Washington, D.C., Jan. 20, 2009. More than 5,000 men and women in uniform are providing military ceremonial support to the presidential inauguration, a tradition dating back to George Washington's 1789 inauguration. (DoD photo by Staff Sgt. Timothy Kingston, U.S. Army.